Lakefront, Gameroom on Roamingwood Lake. Walk to Beach, Pool, and Clubhouse. This property is located on the largest lake in The Hideout. It is walking distance to the main pool and beach and The Tiki Bar. We offer you a row boat, a paddleboat/pedalboat and a canoe for your use at no additional charge. It includes several full size video arcade games, a pool table, and a jukebox. There are several 50" HD flat screen tvs. There are also tv's located in all the bedrooms with Cable. Indoor fireplace, and an outdoor gas fire pit for your use. We do not rent to groups under 27yrs of age. In the winter there is sking and sno-tubing on the snow hill located within the development. Big Bear mtn is just 20 minutes away if you are looking for a bigger adventure. 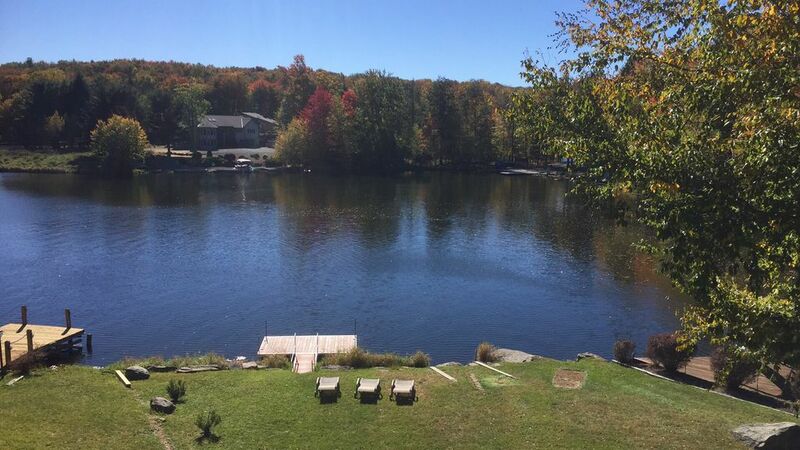 This property sits atop a hill overlooking the lake, and I is walking distance to the lake and pool, and tiki bar. Video games, fishing in the backyard, and gives you use of paddle boat, row boat, canoe and boats. Brand new kitchen with granite countertops. This is a lakefront property. We are right on the lake. Views of the lake from kitchen and living room. We are right on the lake. We provide a rowboat and canoe for your use. No you may not bring your own. The back yard is the lake. 5 Full Size Video Arcade Games, and Pool Table. We provide a row boat, pedal boat/paddle boat, and a canoe. There is skiing, snowboarding, and tubing located right in the community. Indoor and outdoor tennis available in the community. 9 hole golf course right in the community. Main level has 2 Bedrooms, 2 Bathrooms, the Kitchen and the Main Livingroom. Second Level has Gameroom, 2 Bedrooms, and A Bathroom. Our visit to the Boathouse was 2 nights with 7 adults and 7 kids. The house was perfect for the number of people we had. John was very easy to communicate and helpful with any issues that we had. We were a little disappointed at the looks of the lake when we first arrived. (Thanks for the doings of Mother Nature.) The water level was so low. However, by the morning we were leaving the lake looked my like the pictures we had seen on the site. Our family had a wonderful time staying at this property! Even though the weather was cold, it was lovely to wake to views if the lake. Would love to visit again in the summer. This home offered a great location with lots of sleeping arrangements and would be great for a group. The arcade games and jukebox were excellent for some evening fun with the family!! Just spent a couple of days over New Years at the house with some friends and their families. 7 adults and 7 kids (ages 7 - 10) in total. Considering the size of the group, the house worked out well. The house was very clean and comfortable for us. The pull out couches in the common areas allowed for the kids to have a "sleepover" and hang out space for themselves watching movies / TV. John was very responsive on a couple of minor issues which were resolved quickly. The kids had an absolute blast in the basement with multiple flat screen tv's, 6 video game cabinets (with a dozen or so games to select from per cabinet), pool table and jukebox. The property was big enough to let the kids get out and explore, play basketball etc. We went snow tubing a short distance away as well. It really couldn't have worked out better for our group. Would love to come back in the summer to fully enjoy the lake. Highly recommend the location and specifically this house. Enjoyed the stay. The house was very and maintained. Enjoyed the video games. We had four families come together for the weekend. The game room was a hit because it rained the majority of our time there. We were only there for 1 full day, next time we want to stay longer to be able to enjoy the lake, property, etc! We all would definitely recommend this place to others looking for a relaxing weekend getaway! Golf: 9 Hole Golf Course right on the premises of the community. Ski: Chairlift and skiing right in the community. Tennis Courts, Lakes, Pools, Basketball, Bocce ball, Playgrounds, etc.